Posted March 1, 2017 by Tony Jones & filed under Books. 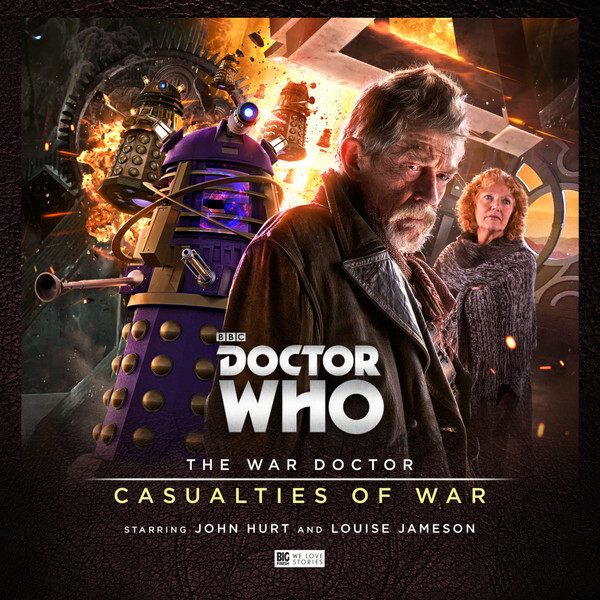 With this final boxset of three stories, Big Finish marks the end of War Doctor’s story with a strong set of scripts brought to life by a superb cast, great directing and impressive sound design. With John Hurt’s passing away, listening to these stories is all the more poignant; as fans we can but admire the way these stories have given us an insight into the character of the War Doctor, and a sense of how he became the figure portrayed in ‘The Day of the Doctor’. The set also gives us another twist – Louise Jameson as Leela, dealing with a version of the Doctor who denies the very name. This set has a theme of casualties of war – it doesn’t dominate but does give a flavour to the three tales. First up is Guy Adams Pretty Lies with the first casualty being truth. Guy weaves a story with both comic elements and dark drama as the War Doctor and Cardinal Olistra (Jacqueline Pearce) are trapped with access to a TARDIS on a planet in line for Dalek invasion. To add to the mix, a war reporter is trying to record events, and this gives a humorous yet dark element to an otherwise grim story. Joseph Kloska is the reporter and Mark Esltob his Editor. The story builds momentum and grows the tension between the two time lords as Ollistra is forced to get her hands dirty on the battlefront. Andrew Smith gives us the next casualty, and it’s Leela. In The Lady of Obsidian. This is a remarkable piece of writing on many levels, including not only with Leela’s backstory (and moving portrayal by Louise) but also a new enemy, the Unlived, who change the Dalek / Time Lord dynamic in a convincing and unsettling way. As a new foe they work well due to their simplicity; in other stories Big Finish has crafted aliens (such as the Eminence) with a lot of attention to detail. In Lady of Obsidian Andrew paints the Unlived with a few brush strokes, and they are all the better for it. Director Nick Briggs ends the set with his story The Enigma Dimension. This becomes a character study driven by the Ollistra / War Doctor tension and the final casualties of this war are the Daleks and Time Lords themselves, trapped by their own natures and by their shared history of mutual hatred. Avoiding the big battle scenes of earlier parts of the war, here, finally we have in John Hurt a hero who we believe could contemplate the destruction of both races as depicted in ‘Day of the Doctor’. There’s a raft of great performances and a fitting way to mark the end of John Hurt’s reign as the War Doctor. Released in February 2017 by Big Finish.